Offers advanced traffic management, troubleshooting, access control, and monitoring support at a reduced cost. The 75 W PoE power budget supplies PoE+ (up to 30 W) to ports 1-8, along with PD (powered device) auto classification and over current/short circuit protection. Smart fans save energy and reduce operating noise by varying fan speed and usage based on real-time cooling needs. 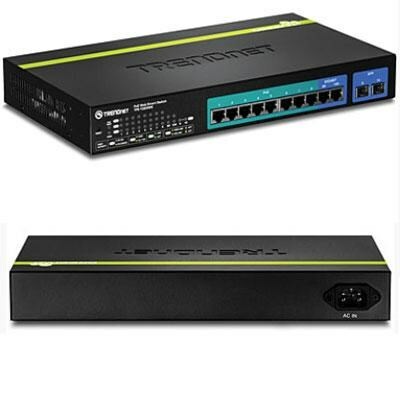 Provides 8 x Gigabit PoE+ ports, 2 x Gigabit Ethernet ports, 2 x shared SFP slots (shared with ports 9-10), a PoE Power budget of 75 Watts, and includes rackmount brackets.